We got up early again and had breakfast together. We drove to Fiesole and caught the bus to Florence. 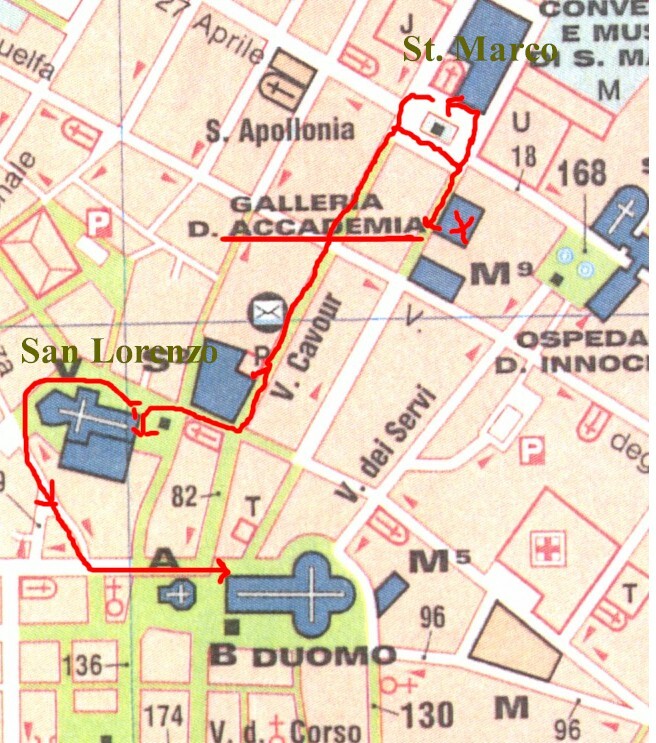 We had at 10:30 reservation at the Galleria dell’ Accademia. We got there in plenty of time so we had a coffee first in a nearby cafe. Even though we had been to the Accademia the last time we were in Florence, we wanted to see Michelangelo’s David again…so did Mike and Mary. The Accademia was founded in 1563 and was the first school in Europe set up to teach techniques of drawing, painting and sculpture. 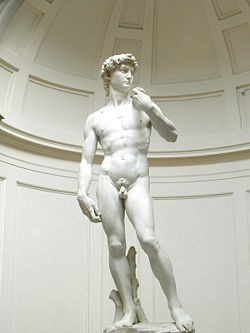 The statue of David is the most famous piece of art in the Accademia. Michelangelo began carving this seventeen foot statue in 1501 in front of the Palazzo Vecchio in the Piazza della Signoria. It was moved indoors to the Accademia in 1873. There is a copy of the statue in its place in the Piazza. The statue is really breath taking. We were able to see a lot of other works while we were in the Accademia. Again as with the Uffizi and other museums, we recommend that you buy your tickets on line well before beginning your trip. There is always a long line at the Accademia and with a time scheduled tickets, you go right in. 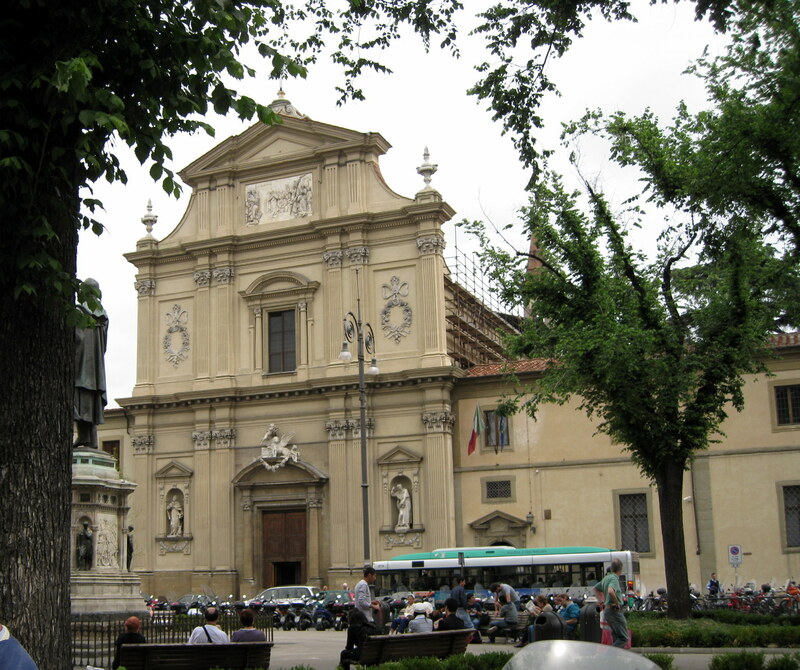 Nearby were St. Marco Square and St. Marco’s church and monastery. The monastery, which is now a museum, was during the 15th century, home to two famous Dominicans, the painter Fra Angelico and the preacher, Girolamo Savonarola . The monastery was founded in the 13th century and enlarged in 1437 by Cosimo de' Medici. Each cell of the monk’s cloister and many other walls were decorated by Fra Angelico in collaboration with others, including Benozzo Gozzoli . 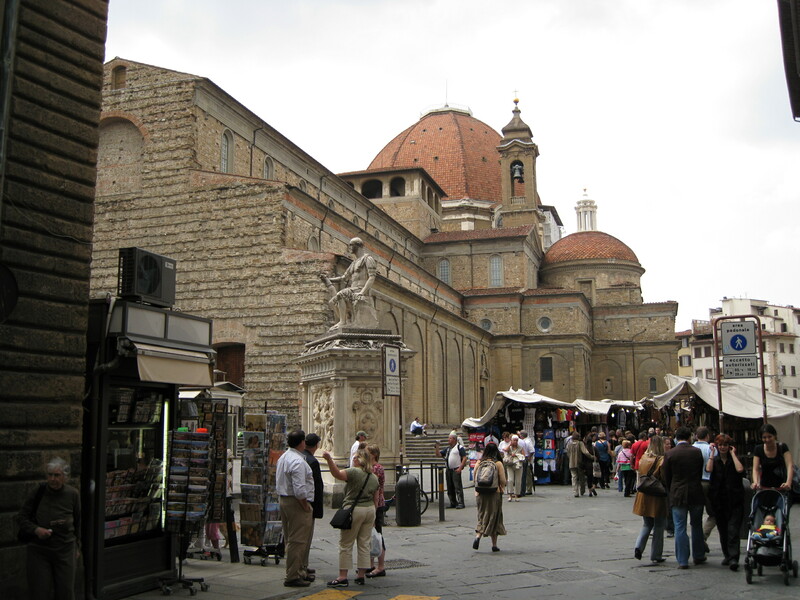 San Marco is famous as the seat of Savonarola's discourses during his short spiritual rule in Florence in the late 15th century. He was later burned in the Piazza della Signoria as a heretic. The church itself was consecrated in 1443. 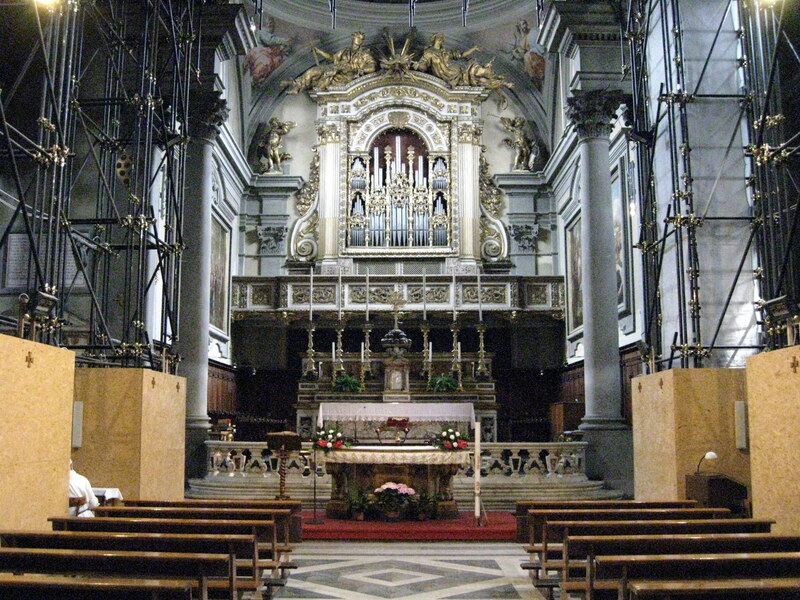 It has a single nave with side chapels designed in the late 16th century by Giambologna, and houses paintings from the 16th–17th centuries. In the late 17th century the apse and the carved ceiling were completed. A further renovation was carried out in 1678. The fa çade, in the Neo-Classical style , was built in 1777–1778. 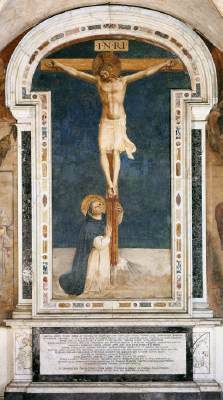 The crucifix on the high altar is by Fra Angelico (1425–1428). In the first altar to the right is St. Thomas Praying by Santa di Tito from 1593, while on the second altar is a Madonna with Saints by Fra Bartolomeo. There was some restoration going on in the church. We getting hungry but Mike was feeling unwell so my wife and I stopped at a nearby cafeteria. Mike and Mary decided to skip lunch and look for an internet café. The cafeteria had several rooms and was very attractive. I had Lasagna and my wife had canatini. Next the two of us went to San Lorenzo church. 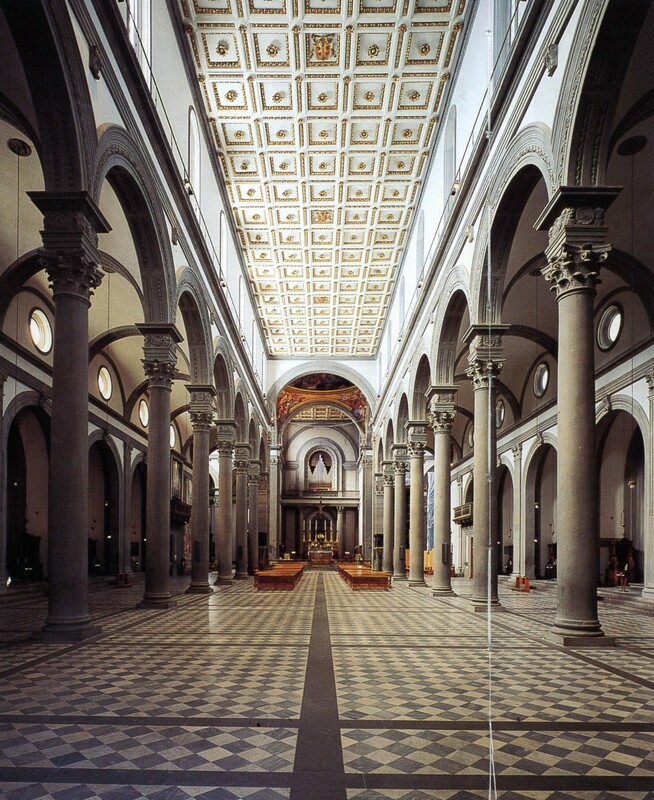 San Lorenzo was the parish church of the Medici family, who lavished their wealth on its adornment. 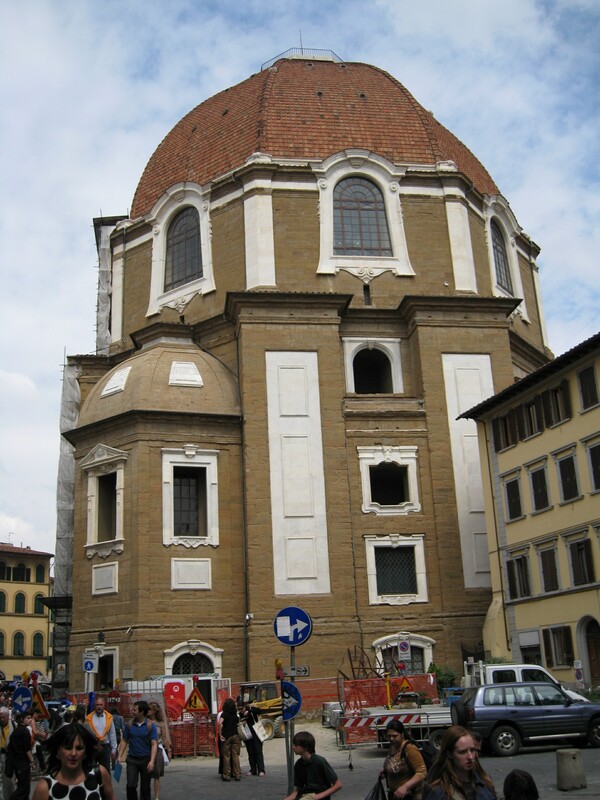 Brunelleschi, who built the dome for the Duomo, rebuilt the church in the Renaissance Classical style in 1419. 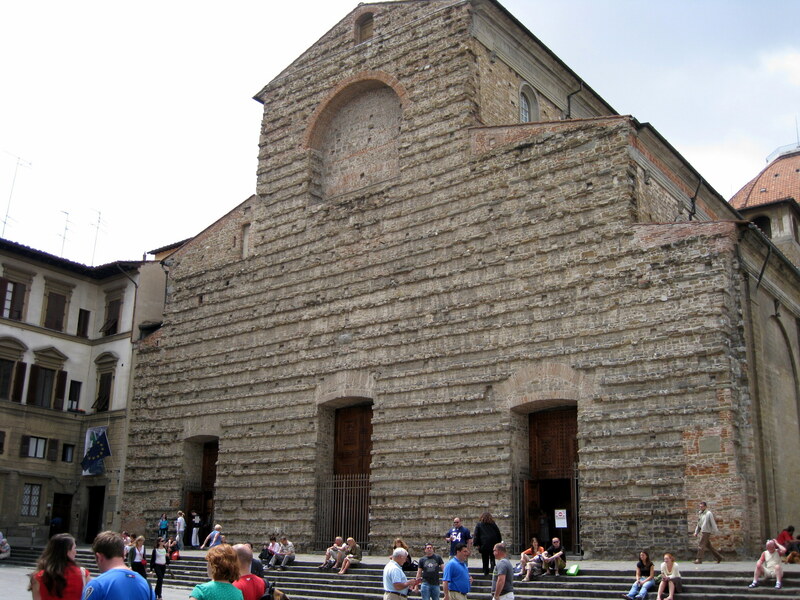 The exterior face was the same unfinished fire brick that we had seen in several other churches and was never completed even though Michelangelo submitted several designs. It was quite beautiful on the inside. 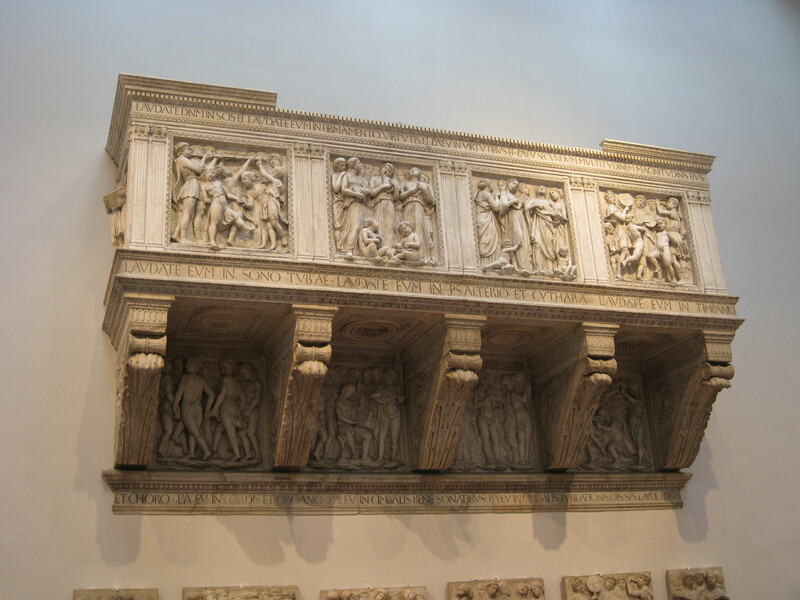 Of note was Donatello’s pulpit which he craved out of bronze in 1460 at the age of 74. In order to enter the Cappella dei Principi and the Medici tombs, we had to go back out and around to the back of the church. There were a lot of vendors all around the outside. We bought our grandchildren a couple of soccer shirts. We walked behind the church and found the Capella dei Principi, which was begun in 1604 but not completed until 1962. Above was a huge dome similar to the Duomo’s but designed by Buontalenti. 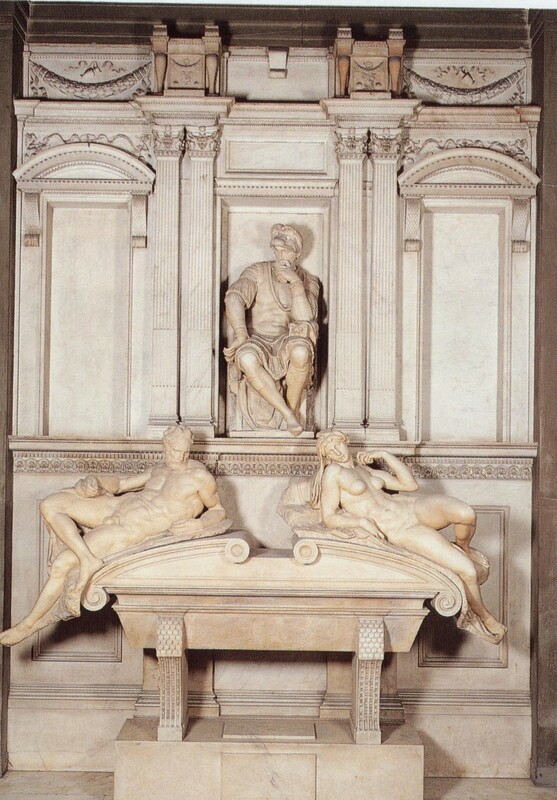 From there we entered the Medici Chapel where we saw the tombs of several members of the Medici family with statues by Michelangelo. We walked back toward to Duomo. Behind it we found a nice sidewalk café where I had a gelato and my wife had cake and coffee. The Duomo museum was open so we ventured in and saw a lot of wonder original statuary that had been in and on the Duomo. The original baptistery door panels were there. Photographs were allowed. We met Mike and Mary at the Duomo steps and caught the bus back to Fiesole. Mike wanted to go back to the Ristorante La Tavernetta in Pontassieve where we had eaten two nights before. The food had been good even though it was some distance away. We were among the locals again who gave us the once over. I had steak again. They changed from the small mushrooms to ONE big one. My wife had a pizza. Tomorrow will be our last day in Tuscany.